Mr. Fiterstein’s 2010-11 season includes a performance of Mason Bates’ Mercury Soul for Clarinet and Piano (composed for Mr. Fiterstein) with the Chamber Music Society of Lincoln Center; the Mozart and Weber clarinet quintets at Bargemusic in NYC; and Mozart’s clarinet quintet with the Daedalus Quartet for the Philadelphia Chamber Music Society. 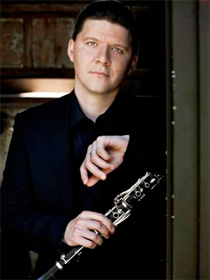 He performs Weber’s Clarinet Concertino, Copland’s Andante from his clarinet concerto, and Ellstein’s Hasidic Dance with the San Juan Symphony in Colorado; Copland’s clarinet concerto with the Belgrade Philharmonic Orchestra; Mozart’s clarinet concerto with the Israel Sinfonietta Baer-Sheva; Brahms’ sonatas and Schubert’s Shepherd on the Rock with pianist Ken Noda for Miami Friends of Chamber Music; plays works by Kurtág and Dohnányi for the Boston Chamber Music Society; appears with cellist Steven Isserlis at New York’s 92nd Street YMHA; and collaborates with jazz pianist John Stetch. Mr. Fiterstein, a winner of the Young Concert Artists International Auditions, will also perform Shulamit Ran’s For an Actor: Monologue for Clarinet as part of the Young Concert Artists 50th Anniversary concert at New York’s Symphony Space. As a soloist, Mr. Fiterstein has appeared with the Orchestra of St. Luke’s at Lincoln Center, Simon Bolivar Youth Orchestra of Venezuela, Danish National Radio Symphony Orchestra, Jerusalem Symphony, Tokyo Philharmonic, China National Symphony Orchestra, Vienna Chamber Orchestra, Polish Chamber Philharmonic, Israel Chamber Orchestra, and the Czech Chamber Orchestra Pavel Haas. He has performed in recital on the “Music at the Supreme Court” Series, at the National Gallery of Art, the Kennedy Center, the 92nd Street Y, Carnegie’s Weill Hall, the Isabella Stewart Gardner Museum in Boston, the Louvre in Paris, Suntory Hall in Tokyo, and the Tel-Aviv Museum. A dedicated performer of chamber music, Mr. Fiterstein frequently collaborates with distinguished artists and ensembles. He was a member of the prestigious Chamber Music Society II of Lincoln Center (2004-2006), participated in the Marlboro Music Festival for four summers and toured with Musicians from Marlboro. He appeared at the Mecklenburg-Vorpommern Festival in Germany, the Storioni Festival in Holland, and the Jerusalem International Chamber Music Festival. Mr. Fiterstein has performed chamber music with Daniel Barenboim, Mitsuko Uchida, Richard Goode, Emanuel Ax, Elena Bashkirova; and has joined the American, Borromeo, Daedalus, Fine Arts, Jerusalem, Mendelssohn, Muir and Vogler String Quartets and appeared with Ensemble Wien-Berlin. He has performed chamber music at Carnegie Hall, Lincoln Center, 92nd Street Y, the Kennedy Center and the Library of Congress in Washington DC, and at the Louvre. Mr. Fiterstein is the founder of The Zimro Project and the Alexander Fiterstein Trio. The Zimro Project, founded in 2008, is a unique ensemble dedicated to incorporating Jewish art music into chamber music programs that is inspired by the Zimro Ensemble, a group that nurtured the music of Jewish composers and culture nearly a century ago in St. Petersburg, Russia. The Alexander Fiterstein Trio was also formed in 2008 with cimbalom player Walter Zev Feldman and accordionist Christina Crowder. The trio regularly performs a program of Klezmer music from the traditional Eastern European Jewish wedding ceremony. Alexander Fiterstein has worked with composers such as John Corigliano and Osvaldo Golijov and has had pieces written for him by Samuel Adler and Mason Bates, among others. He performed the U.S. premieres of Henrik Strindberg’s Clarinet Concerto “Minne,” Harrison Birtwistle’s Pulse Shadows and Paul Schoenfield’s clarinet trio. A recording of Schoenfield’s trio, performed by Mr. Fiterstein with James Tocco and Yehuda Hanani, was released in May 2010 on the Naxos label. This fall Mr. Fiterstein will record the clarinet music of Ronn Yedidia to be released by Naxos in the 2011-12 season. Mr. Fiterstein was born in Belarus. At the age of two, he immigrated with his family to Israel where he later studied at the Israel Arts and Science Academy. He graduated from the Interlochen Arts Academy and the Juilliard School. His teachers included Charles Neidich and Eli Heifetz. Mr. Fiterstein is a first prize winner of the Carl Nielsen International Clarinet Competition and the “Aviv” competitions in Israel; and he is the recipient of the Bunkamura Orchard Hall Award (Tokyo) and numerous awards from the America-Israel Cultural Foundation. Mr. Fiterstein is the clarinet professor at the University of Minnesota, Twin Cities.